A fortnight back Mangal had pointed me to some plants he had planted between two coconut palms. Busy digging up earthworms I had not paid much attention and had totally forgotten about them. This Sunday I came across them, reaching my knees. In order to confirm I sent a pic via wat’s ups to KM. Yes, it was van tulsi. “Where did you get it,” she asked. I promised that when it seeds in March I shall deliver them to her. 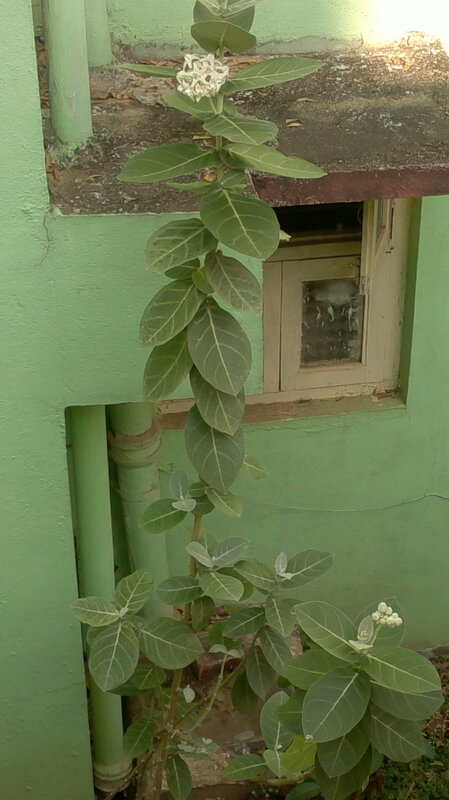 The leaves of ‘Senticom Osium’ (Van Tulsi) are pale greenish-yellow in colour. 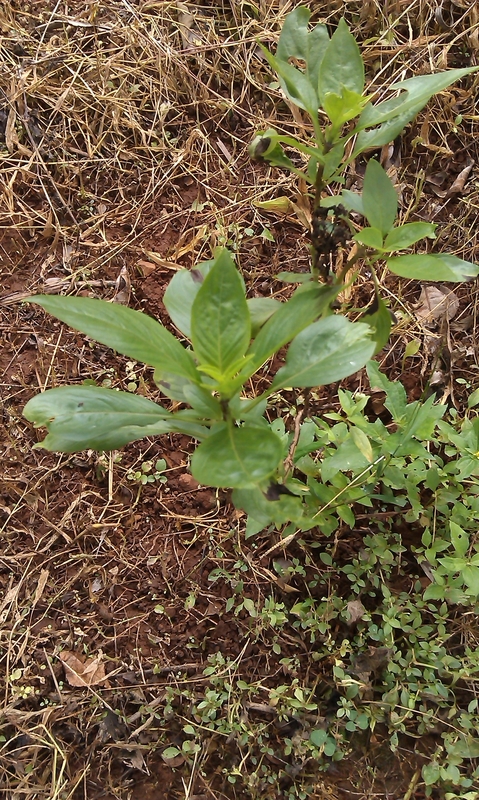 The leaves have a sweet, spicy, herbaceous and slightly campherous odor. The extracted oil from its seeds has intensely fresh, sweet-spicy herbaceous and vibrant aroma. The oil has medicinal properties and is considered excellent tonic for treatment of nervous disorders and stress related headaches. It also assists in relieving from intellectual fatigue and giving clarity to the mind. Further, the oil also assists in relieving gout through minimised uric acid in blood. Anything about plants excite me because I believe we have still to learn a lot from the plant world. Let me share my experience with papaya leaf extract. Few months back I was recipient of a mail which extolled the virtues of papaya leaf extract and how it helped increase blood platelet count among victims of dengue. I was sceptical of the mail and had forgotten about it until a friend called me to say that it had really worked in the case of his cousin. Forty plus Bengalaru resident Rajlakshmi Nair was diagnosed with dengue and admitted to Manipal Hospital on August 28. When admitted her platelet count had dipped to 16000. She was given blood transfusion which led to the platelet jumping to 30,000. The doctors prescribed pain killer, namely Dolo 650 and Paracetamol for fever. Rajlakshmi’s brother-in-law, a NRI from the US, who was among the many recipient of the ‘papaya leaf mail’ advised the patient’s family to give the papaya extract a try. Since there was nothing to lose, her sister decided to give it a try. As suggested, the family members took six leaves of papaya plant and crushed to make it into balls, the size of marbles. Rajlakshmi was given the first ball next day morning along with jaggery to counter the bitterness of the extract. By evening her platelets had shot up to 50,000. She continued taking the papaya leaf balls along jaggery during her four-day long stay in the hospital. During this period she was not given any more blood transfusion. Discharged and recuperating at home Rajlakshmi continued taking one ball of papaya leaf extract for the next four days. At the end of eight days her platelet count had reached 6.40 lakh giving credence to the fact that papaya leaf extract really worked on dengue victims. Researchers have found that papaya leaf extract can be effective against various tumors and can be used as a traditional medicine. Nam Dang, a researcher from the University of Florida and his colleague from Japan documented the anti-cancer effects of papaya against cervical tumors, breast, liver and pancreas. This research’s report has also been published in the Journal of Ethnopharmacology. The researchers used extracts made from dried papaya leaves and found the resulting effects can be more powerful. 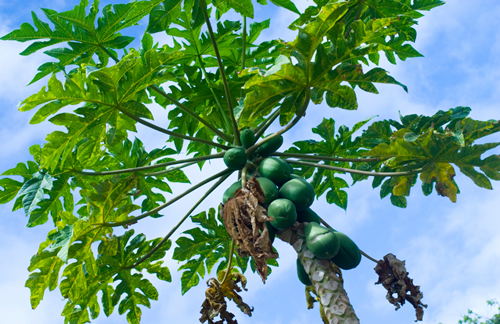 Dang and other scientists showed that the papaya leaf extract could increase the production of a key signal molecule called TH1 type cytokines, these molecules help regulate the body’s immune system. “This could be a maintenance therapy to fight cancer cells by increasing the body’s immune system,” researchers said in the journal, which was released last February, as quoted from AFP, (10/3/2010). Scientists said that papaya leaf extract has no toxic effect on normal cells, this of course can avoid the side effects which generally always occur in some cancer treatments. Strain the liquid and bottle in glass containers. You can keep the concentrate in the refrigerator for three to four days. If it becomes cloudy, it should be discarded. Lately National Medicinal Plants Board has been buying space in newspapers to inform readers about different schemes to support cultivation of medicinal plants. In fact, the Board through its State agencies gives ample subsidies to farmers who are willing to take up cultivation of medicinal plants. Being a Sunday farmer I thought why not? And so called up the board number of NMPB and tried speaking to the CEO. The man who picked up informed me, “Sahaab Bahar gaye hain.” Before I could ask whether I could speak to someone lower in the hierarchy, he had put the phone down. I was not willing to give up, so I called up the number again and having got the names of other officials (thanks to its website) I just asked for one Dr Rawat. I introduced myself and asked him for guidance. “Sir one acre plot is too less for commercial cultivation,” he said. That was enough to discourage me but I persisted. He came up with an idea, which he might have thought was very brilliant. “Your plot is closer to Mumbai where the rates are very high. Why don’t you make it a nature park grow medicinal plants and herbs and invite people? You can tie up with a local hotel or resort so that you will get regular visitors,” he suggested. Dr Rawat was not aware that leaves of stevia are available for Rs 300 onwards per kg. I said thanks and called up my friend, Jitendar and asked him to get me some info on stevia through his contacts in Benaras Hindu University.